Kathryn Margaret Sharkey, 71 of Santa Barbara, California, originally from Boston, Massachusetts, passed away on December 25, 2015 at Cottage Hospital with her son by her side. 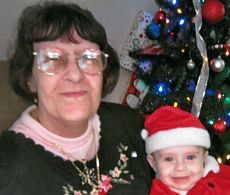 A devoted single mother and “Nana” who dedicated her life to raising her son and caring for her grandson. She was a very kind, loving and selfless woman who will forever remain in our hearts. She is survived by her son, Benjamin Sharkey and grandson, Benjamin Sharkey Jr.